PILSEN — When Sonia Yañez ditched all the unhealthy soda at her first Pilsen grocery store, many customers were upset to the point of boycotting the shop. The Coke is back at MeztiSoy, her new shop at 1757 W. 18th St., but now Yañez hopes it will be a means to introduce customers to other products at the store, which include organic and locally-produced items, fair trade products, and a small cafe with a juice bar in back. Yañez and her husband Victor Perez opened MeztiSoy — a play on both the food and the Mexican verb “I am” — in August. 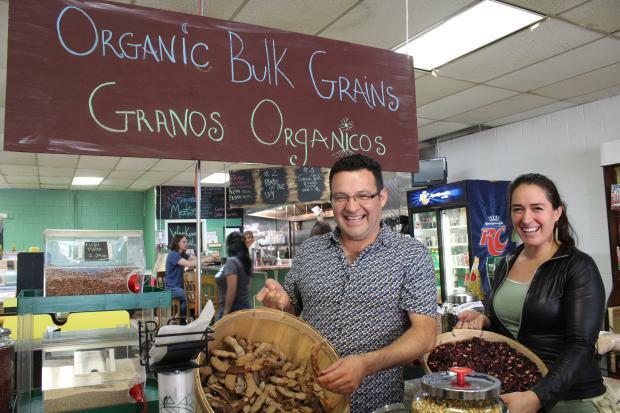 In 2006, when she opened Soy Organic, her first shop, Yañez said her focus was more on the organic products, in addition to providing healthy cooking classes for those in the neighborhood. They sold pop but stopped because Yañez worried about the effect it was having on customers' health. “When we eliminated Coke, we got cursed. There was constant fighting and they would boycott us,” Yañez said. But according to Perez, the soda and cheaper groceries are what bring in many from the neighborhood. “Some of them, they just don’t care. And 75 percent of them, that’s our market. People who just want to buy groceries and don’t really care about whether or not there are pesticides,” he said. Perez grew up on a ranch in Mexico and immigrated to the U.S. over 26 years ago. He said he thinks many in the community are attracted to sugary drinks and cheap food for the same reason he was: for an immigrant working low-wage jobs, paying the rent can often take priority over food. In offering the cheaper more familiar products, the husband-and-wife team hope to build up a clientele that will ultimately become curious about the organic and fair-trade products. MeztiSoy sells locally-made honey, bread, spices and jars of organic beans and quinoa. Yañez has been in talks with Edgewater’s Phoenix Bean and will soon carry their tofu, sprouts, soy milk and noodle products. Like at her old shop, Yañez wants to offer cooking classes as a way to teach people exactly what they’re supposed to do with those products after they buy them. Yañez said she hopes the shop will reconnect many Hispanic residents in the neighborhood to their culinary roots. “We want to come here and just, remind everyone where we come from,” she said. “The community is our family, being raised and born here. God opened this door, an opportunity for us, and we came."